Identification. Zimbabwe is named after Great Zimbabwe, the twelfth- to fifteenth-century stone-built capital of the Rozwi Shona dynasty. The name is thought to derive from dzimba dza mabwe ("great stone houses") or dzimba waye ("esteemed houses"). Cultural and religious traditions among the Shona, Ndebele and smaller groups of Tonga, Shangaan and Venda have similarities in regard to marriage practices and the belief in supernatural ancestors. All those groups called on the support of the spirit world in the struggle for independence, which was achieved in 1980. European culture and values indelibly shaped the urban and rural landscapes, particularly in terms of the use of space, and the structure and practice of government. Black Zimbabweans have assimilated more white Zimbabwean culture than vice versa. In these distinct cultures, which generally are referred to as African and European, the most obvious differences are economic. While the white minority lost political power after Independence, it has retained a disproportionate share of economic resources. Location and Geography. Zimbabwe is in central southern Africa. Because of the impact of its colonial history on the nation's political, economic, and sociocultural life, it generally is identified more with southern Africa than with central Africa. A land-locked country of 242,700 square miles 390,580 square kilometers between the Zambezi River to the north and the Limpopo River to the south, it is bordered by Mozambique, South Africa, Botswana, Namibia, and Zambia. Most of the country is a high to middle veld plateau with extensive areas of wooded savanna and a temperate climate; the low veld of the Limpopo and the Zambezi Valley is hotter and has less rain. On the Mozambique border, the only mountainous area, the Eastern Highlands, runs from Nyanga in the north to Chimanimani in the south. Rainfall is higher in the north of the Eastern Highlands and lower in the Zambezi Valley and the low veld. 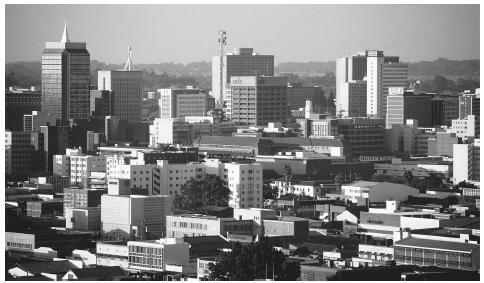 The capital, Harare, is located in Mashonaland, which covers the eastern two-thirds of the country and is the area where most Shona-speaking people live. The second city, Bulawayo, is in Matabeleland in the west, where most Ndebele-speaking people live. Demography. At the beginning of the twentieth century, the population is estimated to have been about six hundred thousand. The 1992 national census estimated it at over ten million, and with a growth rate of 3 percent, it is expected to be over twelve million in 2000. About 70 percent of the population lives in rural areas, and Harare and Bulawayo account for most of the approximately 30 percent in urban areas. The largest ethnic group is collectively known as the Shona and consists of the Manyika, Zezuru, Karanga, Korekore, Rozwi, and Ndau groups, which make up about seventy-six percent of the population. The second largest ethnic group is the Ndebele, consisting of the Ndebele and Kalanga groups, which constitute about 18 percent. Mashonaland, where most of the Shona live, is a collective term for the eastern two-thirds of the country, and most Ndebele live in the western third of Matabeleland. Other ethnic groups, each constituting 1 percent of the population, are the Batonga in the Zambezi Valley, the Shangaan or Hlengwe in the low veld, and the Venda on the border with South Africa. About 2 percent of the population is of non-African ethnic origin, mainly European and Asian. pattern. First, the acquisition of large tracts of land by white settlers for commercial agriculture, until shortly after World War II resulted in a situation in which half the land was owned by well under 1 percent of the population, with limited access to land for the vast majority of the rural population. 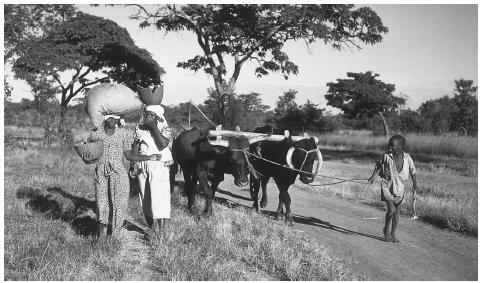 Second, in the colonial period, the development of industry in towns and cities, particularly Harare and Bulawayo, required men seeking work to live in urban areas, leaving women and children in the rural areas. Although this gender imbalance in urban areas no longer exists, and there is more movement between urban and rural areas, de facto women heads of household are still common in rural areas. Most jobs continue to be found in urban areas and employment income rather than income from farming is the most important factor in the standard of living among smallholder families. The third major change has involved the age profile of the population. A sharp drop in mortality rates and longer life expectancy between 1960 and 1992 meant that almost sixty-three percent of the population sixteen to thirty-four years of age. The statistical impact of the AIDS epidemic on the population will not be clear until the next national census in 2002, but that disease is considered a major factor in higher maternal and infant mortality rates. Linguistic Affiliation. All the national languages, with the exception of the official language, English, are Bantu, a branch of the Niger-Congo language family. Shona and Sindebele are the most widely spoken, and students are required to take at least one of those languages. The four main dialects of Shona—Zezuru, Kalanga, Manyika, and Ndau—have a common vocabulary and similar tonal and grammatical features. The Ndebele in the nineteenth century were the first to use the name "Shona" to refer to the peoples they conquered; although the exact meaning of the term is unclear, it was probably derogatory. Later, white colonists extended the term to refer to all groups that spoke dialects officially recognized as Shona. One view of the dialects is that they resulted from differing missionary education policies in the nineteenth century. Sindebele is a click language of the Nguni group of Bantu languages; other members of this language group are Zulu and Xhosa, which are spoken mainly in South Africa; siSwati (Swaziland); and siTswana (Botswana). Other languages spoken in Zimbabwe are Tonga, Shangaan, and Venda, which are shared with large groups of Tonga in Zambia and Shangaan and Venda in South Africa. Symbolism. The national flag and the Zimbabwe bird (the African fish eagle) are the most important symbolic representations of the nation. The Zimbabwe bird is superimposed on the flag, and while the flag symbolizes independence, the Zimbabwe bird represents continuity with the precolonial past. Internationally, particularly in the tourist sector, photographs of Victoria Falls, Great Zimbabwe, and wildlife are symbols of the national history and natural heritage. Emergence of the Nation. San (Bushmen) hunters are believed to have been the earliest inhabitants of the area that is now Zimbabwe. When Bantu-speaking peoples migrated from the north at the end of the second century, the San moved on or were absorbed rapidly into the farming and cattle-herding culture of the Bantu groups. Little is known about those early Bantu groups, but the present-day Shona can be traced to a group that moved into the area around 1200 C.E. From the eleventh century, after commercial relations were established with Swahili traders on the Mozambique coast, until the fifteenth century, the Shona kingdom was one of southern Africa's wealthiest and most powerful societies. Its political and religious center was probably Great Zimbabwe, a city of ten thousand to twenty thousand people built between the twelfth and fourteenth centuries by the Rozvi dynasty. The city was constructed from granite, using highly developed stone-cutting and construction techniques. Historians are unsure about the reasons for its decline in the fifteenth century, but the human and livestock population might have outstripped available resources. Until 1905, when archaeological research proved that Great Zimbabwe was of Bantu origin, and then until independence in 1980, colonial explanations of the city's origins failed to consider that it could be of Bantu origin. The importance of Great Zimbabwe to the colonists, who referred to it as the Zimbabwe Ruins, was also the basis of its importance in the nationalist struggle for majority rule. Whereas the colonists denied its significance, the nationalist movement promoted it as sacred. According to Shona religion, the ancestors who built Great Zimbabwe still live there, and it therefore is a sacred site. Today Great Zimbabwe is one of the most potent symbols of the nations, and the Zimbabwe bird on the flag depicts one of the excavated soapstone sculptures of the fish eagle found at the site. New dynasties followed the Rozvi of Great Zimbabwe, but the kingdom declined in importance. Although Swahili and later Portuguese traders tried to exploit internal differences in the kingdom, they never succeeded. The second significant encounter in the making of Zimbabwe was the Ndebele invasion of the early 1880s under the command of Mzlikazi, who established his capital at Inyati to the north of Bulawayo. He was succeeded by Lobengula, who shifted the capital to Bulawayo. In 1888 Cecil John Rhodes tricked Lobengula into signing an agreement that opened the country to mining prospectors and other speculators. Rhodes then formed the British South Africa Company and organized the "Pioneer Column" and subsequently the first group of white settlers, who moved up from South Africa in search of gold and arable land. After defeating the Ndebele in battle and appropriating land in Mashonaland, the colonists founded Rhodesia in 1895. The first Chimurenga (war of liberation) occurred in 1896, when the Ndebele were joined by the Shona. The war was led by two spirit mediums, Nehanda and Kagubi, who were caught and executed and subsequently became powerful symbols in the second Chimurenga, which started in the mid-1960s. After the establishment of a white legislative council 1899, white immigration increased, and in 1922 the white minority decided that the country would be self-governing (run by the British South Africa Company as a commercial enterprise) and independent of the government in South Africa. In 1923, the British South Africa Company handed the country over to the British Crown, and in 1930, the white minority passed the Land Apportionment Act, which barred blacks from legal access to the best land, simultaneously assuring a source of cheap labor. Between 1946 and 1960, the white population increased from 82,000 to 223,000, and this period witnessed economic expansion, including the construction of the Kariba Dam. Organized resistance to white supremacy began in the 1920s, and in the absence of meaningful reform, radical active resistance started in the 1940s. By the early 1960s the two groups that were to lead the country to independence, the Zimbabwe African People's Union and the Zimbabwe African National Union, had been established. When Great Britain demanded that Rhodesia guarantee racial equality and put in place a plan for majority rule or face economic sanctions, the government declared a Unilateral Declaration of Independence in 1965. A guerrilla war followed that was characterized by political differences between resistance groups and among the white minority. It also was characterized by a close relationship between the guerrillas and spirit mediums. Embodying the ancestors, the spirit mediums represented a common past, untainted by colonialism, that could be drawn on to shape and legitimize a new national identity. After the negotiation of a settlement at the Lancaster House Conference in 1979, the first multiparty general elections were held with complete adult suffrage in 1980. The Zimbabwe African National Unity party led by Robert Mugabe won the majority of seats and took over the government in April 1980. Seven years later, that party and the Zimbabwe Africa People's Union merged. While there are minor political parties, Zimbabwe has effectively been a one-party state. National Identity. The adoption of the name "Zimbabwe" and citizens' identity as Zimbabweans, functioned as a symbol of continuity with the past. The common struggle of all groups was instrumental in forming a sense of national identity. Political tensions between the Ndebele and the Shona, which culminated when the army suppressed dissidence in 1983 and 1984 in the Matabeleland Massacres, have been contained by the state. Urban centers are divided into areas of low and high housing density (formerly referred to as townships) for low-income families. The use of space therefore is closely correlated with socioeconomic status. High-density areas have been planned with water and power supplies. Little artistic emphasis has been placed on architecture, and with the exception of some well-maintained colonial buildings, especially in Harare and Bulawayo, buildings tend to be functional. Mud and wattle or sun-dried bricks are used in house building in rural areas; well-off families may use concrete blocks. Traditionally, houses were round with thatch roofing, but an increasing number are square or rectangular with zinc sheet roofing, although kitchens are still built as roundavels (round thatched mud huts). The most marked use of space is in the kitchen, where a bench runs around the right side for men to sit on, while women sit on the floor on the left. Areas of higher rainfall and therefore higher agricultural potential attracted a large number of white settlers at the end of the nineteenth century. That group appropriated land and established a self-governing colonial state and two systems of land use; one for smallholding subsistence farming and one for large-scale commercial production and speculation. Those systems have had different effects on the physical environment, giving rise to controversy about the causes and effects of overgrazing and erosion and raising issues of equity with respect to access to land. Population density is low in the commercial farming areas and relatively high in the smallholder areas and communal areas. Smallholdings are scattered because people prefer to have some bush between themselves and their neighbors. The term "village" is used to refer to an administrative area and does not imply the presence of a number of houses in a small area. Another important influence on land use and the physical environment was the designation of protected areas as national parks or safari areas, covering about 13 percent of the land area. These areas are important to tourism and the national economy. Farm workers winnow soya beans. Agriculture and forestry accounts for 14 percent of the GDP. some parts of the country, but generally rice is not an everyday food. A few food taboos with serious health consequences are still widely practiced. Traditionally eggs, were believed to cause infertility in women and therefore were avoided, but they are now widely consumed. The meat of one's clan totem was traditionally avoided; even today animals representing totems are rarely eaten. Eating out is not common, even among men in the urban areas. Travelers purchase soft drinks and prepared food, such as fried cakes, potato chips, roasted maize, and sugarcane from vendors. A higher proportion of the white population regularly buys prepared meals and eats in restaurants. Food Customs at Ceremonial Occasions. Roasted and stewed meat is the food of celebrations; an ox, cow, or goat may be slaughtered in the rural areas, depending on the significance of the event, and may be accompanied by rice. 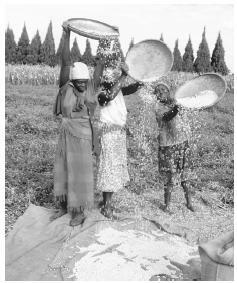 Beer made from millet usually is prepared by women, and roasted groundnuts are served on special occasions. Basic Economy. Agriculture is the mainstay of the economy for over 70 percent of the population, although manufacturing accounts for about 25 percent of the gross national product (GDP) and is the most important macroeconomic sector. Economic decline began in the mid-1980s, when foreign demand for minerals dropped, and this situation was worsened by the impact of several droughts and structural adjustment polices that have had a disproportionate impact on the poor. Since the opening up of the South African economy in 1994, increased competition in export markets and the increased availability of South African goods in Zimbabwe have heightened macroeconomic concerns. Until 1992, the country was self-sufficient in grain, and a massive increase in maize production by smallholders was a postindependence success story. However, since that time, annual grain production has not always met demand because of a decline in producer prices and an increase in the population. The major crops grown by smallholders on the high and middle veld plateau are maize, sunflower, groundnuts, and cotton. In the Zambezi Valley more millet and sorghum are grown than maize, but only for subsistence, and cotton is the only major cash crop. The west and the low veld are predominantly cattle-raising areas. Self-sufficiency varies at the household level and depends on a variety of factors, including rainfall and the type of grain grown (maize or more drought-resistant millet and sorghum) and the availability of draft animals. To increase grain production for household consumption, the government and nongovernment organizations are encouraging farmers to grow more millet and sorghum. This is meeting with only limited success; most people prefer the taste of maize, and it is less labor-intensive to harvest and prepare for consumption. Meeting grain deficits is dependent on cash income from the sale of cash crops (for example, groundnuts and cotton) or cash remittances from workers in the towns. There has been a steady movement of maize and goats from rural to urban areas. The basic unit of currency is the Zimbabwe dollar. A family attends to their fields. Young children, like the boy pictured above, learn adult tasks early on—as early as seven or eight years old. which cover about 40 percent of the country. Freehold small-scale commercial farms that were established as "native purchase areas" by the 1930 Land Apportionment Act cover approximately 4 percent of the country. Other major categories of land use are state-owned areas protected for their wildlife, flora and fauna (about 13 percent of the country), and forests, particularly in the Eastern Highlands. Freehold land is privately owned, but communal land is vested in the president and allocated through rural district councils that grant consent for use according to customary law. In practice, chiefs have the right to allocate usufruct (rights to use the land) to married adult men; women have access to land only through their husbands. Resettlement areas were established after independence to increase black access to land, and land there is allocated by permit. Although women can obtain permits, most women in the resettlement areas secure access to land through their husbands. Freehold landowners are predominantly men; although women have rights to succession, inheritance by widows and daughters is rare. As with land, property is predominantly male-owned. Commercial Activities. During the period of the Unilateral Declaration of Independence, the country developed a strong manufacturing base, and it continues to manufacture products ranging from household items to steel and engineering products for the construction industry and commercial agricultural products such as textiles and foodstuffs. The diversified economy provides a solid basis for sustained economic growth, but in recent years it has been underperforming. Major Industries. Manufacturing is the largest single sector of the economy (23 percent of GDP), followed by agriculture and forestry (14 percent), distribution, hotels and restaurants (11 percent), and public administration (10 percent). Trade. Major exports include tobacco, gold, ferroalloys, nickel, and asbestos. The main export destinations are Great Britain, South Africa, and Germany. South Africa is by the far the largest source of imports and machinery and transport equipment, manufactured goods, chemicals, petroleum products, and electricity are the largest imports. Division of Labor. In the formal economy, jobs are assigned on the basis of education, skills, and experience; advertising and interviewing precede hiring. In the informal economy, most people work for themselves and pay workers on a cash basis. Government. Zimbabwe is a parliamentary democracy headed by a president. Although the president is elected by direct vote in advance of party elections and holds office for six years, the term during which a party can control the government is five years. Representative structures consist of a House of Assembly and a cabinet appointed by the president; at rural district level, there are elected councils. Each district is made of a number of wards, and wards are subdivided into villages. Each ward and village has a development committee that is responsible for promoting and supporting local development initiatives. Ten chiefs, traditional representatives elected by their peers, sit in the House of Assembly. Alongside the representative structure is the civil service (the administrative structure), the police, the military, permanent secretaries and other ministry staff, and provincial and district administration staff. Military Activity. Military branches of the government are the Zimbabwe National Army, the Air Force of Zimbabwe, the Zimbabwe Republic Police (including the Police Support Unit and the Paramilitary Police). About 1.8 million men aged between 15 and 49 are estimated fit for military service, and over 45,000 were serving in the army at the beginning of the twenty-first century. Expenditure on military activities rose as a result of the country's involvement in the war in the Democratic Republic of the Congo, beginning in 1998. This was the army's first foreign military intervention since 1980. Social welfare programs provide assistance to the destitute and drought relief in the communal areas when there are poor harvests. Zimbabwe provided more relief in the drought of 1991 and 1992 than did international donors. Nongovernmental organizations and churches provide many services that the government cannot, such as rehabilitation of disabled persons and care in the community for the sick. There are eight hundred to nine hundred organizations and associations that engage in activities ranging from advocacy work, to service delivery, to welfare. Membership organizations include farmer's unions, trade unions, and organizations of the disabled, and nonmembership organizations vary from development organizations to charities that provide welfare services. Many of these groups are closely linked with other southern African and international organizations. Church groups, burial societies, and savings and credit groups are the most common informal organizations in the community, and most people, particularly women, are members of at least one. Division of Labor by Gender. The roles of men and women in farming are determined by a land tenure system in which men are allocated land in the communal areas and own most of the land in the commercial areas. Both men and women work the smallholdings in the communal areas, and women are responsible for domestic work. About 70 percent of women are smallholder farmers, compared with 35 percent of men. Commercial farmers rely on hired labor, both male and female. Only in the agricultural sector of the formal economy do women outnumber men; this includes commercial farms and agroprocessing activities. Many enterprises in the informal sector are based on women's traditional economic activities, such as gardening, raising poultry, and baking, to supplement household income. The informal sector has grown considerably because of retrenchment in the formal sector and a decline in household income and is a crucial source of income for many households. Men predominate as government representatives and civil servants, from the cabinet to the village and from ministries to district councils. About 15 percent of members of the House of Assembly are women. Political leadership is male-dominated, although there is a growing challenge to this system from organizations seeking to raise more women to influential decision-making positions. A view of downtown Harare. Most Zimbabwean architecture is strictly functional, like these commercial and office buildings. law over the constitution on the basis of a clause in the constitution that allows for certain exceptions. Marriage. Through marriage a family ensures its survival and continuation into the next generation. Shona, Ndebele, Shangaan, and Venda are patrilineal societies in which descent is through the male line and after marriage a women moves into her husband's home. The Tonga people are matrilineal, and the husband moves to the home area of his wife. Patrilocal or virilocal residence rarely applies in urban areas, but most urban families have a smallholding that is the rural home of the husband and wife. Two types of marriage are recognized under the law. Customary marriages are potentially polygynous and legal for black Zimbabweans only and usually are dissolved only by death (divorce is rare). Civil marriages are monogamous and can be dissolved by death or divorce. Customary marriages are the more common form. Arranged marriages are rare, although families on both sides are heavily involved in marriage negotiations, which include deciding on the brideprice to be paid by the husband to the woman's family; thus, a wife and her children belong to the husband and are affiliated with his kin. Marriage gives women status and access to land, and unmarried men and women are rare. Polygyny is still widespread, although it is declining as land constraints and lower incomes are encouraging smaller households. Divorce is not common and carries a stigma, especially for women. Domestic Unit. In rural areas the family unit is composed of the husband, the wife or wives, children, and members of the extended family. In urban areas, households are smaller, with a tendency toward a nuclear family of the husband, the wife, and children. In polygynous families, each wife has her own house and a share of a field. Households usually are defined in terms of a domestic unit of the wife, the children, and other dependents; therefore, a polygynous family and a wider extended family living together may consist of two or more households. The average household has 4.76 persons. Authority is vested in men, and wisdom is vested in age. After marrying, a man assumes domestic authority as the household head, but in wider family affairs the elders are more influential. A woman also gains authority and respect with age, and newly married daughters-in-law take over much of the housework and help in the fields. Assistance continues after a daughter-in-law has established her own house nearby. The village in Guruve, which consists of traditional thatch-roofed housing (roundavels). to the man. Disposition of the estate and guardianship of children are determined by male relatives of the husband. Women may retain property that is traditionally associated with their domestic role, such as kitchen utensils, and one of the implications of patrilocal residence that has carried into contemporary urban life is that immovable property is regarded as the man's property. Although changes in the law recognize a woman's contribution, it is difficult for a woman to claim rights to property in the face of family opposition. Wills are rare, although they override customary law. In civil marriages ended by divorce or death, wives and widows have the right to a share of the husband's estate, although the same difficulties apply. Kin Groups. Relationships with maternal kin (or, in the case of the Tonga, paternal kin) are important; although contact may be infrequent, the relationship is normally a close one. Therefore, the wider kin group of an extended family can be very extensive. Infant Care. The nurturing and socialization of infants are the responsibility of mothers and, in their temporary absence (for example, when they are working), a female relative. In customary practice orphans are the responsibility of the husband's relatives. A great deal of an infant's time is spent in the company of the mother, being carried on her back in the kitchen and sleeping with her at night. Socialization takes place mostly in the household through the mother and the extended family, and other children nearly always are around to play with an infant. Therefore, in addition to the strong caring bond between mother and child, other adults and older children develop bonds and assume responsibility in the absence of the mother. Child Rearing and Education. An infant or child is seldom lonely, and being constantly surrounded by relatives lays the foundation for behavior in an adult life that is dependent on cooperation within the family. Children learn respect for their elders, which is considered a very important quality. From the age of about seven or eight, girls start to help in the house, and in rural areas boys of that age begin to learn to herd livestock. Children are encouraged to take on adult tasks from an early age. Primary school starts when a child is seven, and after seven years there, a child who has passed the examinations may continue in secondary school for two, four or six years. Children walk to school, and a primary school may be a one-hour walk and a secondary school a longer walk. Walking to school and playing generally are not supervised closely by adults and are important ways in which children learn self-reliance. However, a child is usually dependent on the family economically and socially, and later as an adult the demands of urban life, particularly the reliance on cash to support a lifestyle, can lead to conflict with a rural family's need for cash and traditional values. Higher Education. Higher education is valued as qualification for white-collar and professional occupations and is becoming increasingly important as an entry point to technically skilled employment. Families are proud of children who go on to receive further education, especially in the rural areas. There is no social stigma for the family of a child who was expected to enter college or university but failed to do so. Religious Beliefs. In traditional religion, the spirit of a deceased person returns to the community and the deceased heads of extended families (the ancestors), have a powerful influence on family life. The spirit ancestors are usually only two or three generations back from the living generation and are the people who passed on the custom of honoring their ancestors and the traditions of the community. They are honored in ceremonies to celebrate a good harvest and in appeals to deal with misfortune. When a spirit becomes angry, it communicates through a medium, or a diviner diagnoses the anger and cause, and appeasement follows. Families seeking to avenge a death or enforce debt payment may consult diviner-healers ( n'anga ). Witches are thought to have the power to raise angry spirits, and the anger of a spirit may or may not be justified in the view of the affected family. Many Christians continue to believe in spirits and the power of witchcraft and seek spiritual guidance from both belief systems. The largest churches are the Roman Catholic and the Anglican, and the Apostolic Church is the largest independent church. Independent churches tend to interpret the Bible more in accordance with traditional values, and faith healing and savings organizations (for example, burial societies) feature strongly in their activities. Death and the Afterlife. Customarily, the dead are buried close to home, and people in urban areas may bring the deceased back to rural areas for burial. Graves are prepared close to the family homestead and are both sacred and feared for their association with death and spirits. A diviner may be consulted to determine the cause of death and prescribe a ritual action; this is followed by ceremonies to settle the spirit and mark the end of mourning. After one year a final ceremony is held at which the spirit becomes a spirit guardian of the family. These ceremonies generally combine traditional and Christian practices. Traditional and modern medicines are used, and a distinction is made between minor ailments and serious illnesses. This is done partly because of the belief that illness may have been inflicted by angry spirits (justifiably or through witchcraft). Therefore, treatment for a serious illness may include a consultation with a n'anga. Herbal remedies continue to be used widely for minor ailments, and n'anga are respected for their counseling skills, especially in treating psychological and psychiatric problems. There is a health care system of clinics, district hospitals, and teaching hospitals in Harare and Bulawayo, although in recent years the service has been affected by financial constraints. There is also an association of registered traditional healers, the Zimbabwe National Traditional Healer's Association of N'anga, that includes spirit mediums in its membership. Independence Day is celebrated on 18 April, and Heroes Day on 11 August. Support for the Arts. Artists are held in high regard. In Harare and Bulawayo and to a lesser extent in rural areas, there are many training centers. Some of those centers are self-run, started with the assistance of a patron; some are run by nongovernmental organizations; and some are cooperatives. The most famous is Tengenenge in Guruve District, which has produced many of the most famous Shona sculptors. The National Gallery in Harare, founded in 1954, has been instrumental in the promotion of art, especially sculpture. Competition is high, especially in the sculpture and women's traditional craft markets (baskets, mats, and pottery). 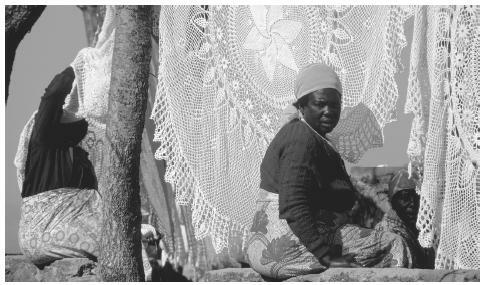 A woman selling crocheted tablecloths in Harare. Many enterprises in the informal sector are based on women's traditional activities. oral literature), the preindependence experience and struggle, and living in a postindependent country. Internationally acclaimed novelists include Shimmer Chinyodya (Harvest of Thorns) Chenjerai Hove (Bones, Shadows) , and Doris Lessing (the Martha Quest trilogy and her autobiographies), who is the most famous white writer. An international book fair is held in Harare every August. Graphic Arts. Shona sculpture is internationally acclaimed and exhibited. Those works fetch thousands of dollars on the international market, particularly in Europe and the United States. Although this art form is referred to as Shona sculpture, it is not specific to the Shona. The themes are derived largely from African folklore and transformed into figurative, semiabstract, and minimalist works that use a variety of stone, including black serpentine. Performance Arts. Traditionally inspired music is predominant in the arts and represents cultural continuity with the past. Based on the rhythms and melodies of the mbira (finger piano), the instrument associated with the ancestors, traditional music promoted a feeling of solidarity in the struggle for independence. Music groups were formed in urban areas, lyrics contained political messages, and the music scene promoted African rather than European figures. Since 1980, the number of cultural groups has increased and public performances have become common. The ready availability of radios has not replaced playing music (usually the mbira or drums) in the home. Thomas Mapfuma and the Blacks Unlimited group are the most well-known proponents of popular music heavily influenced by traditional music. Other influences on popular music include church music, gospel, Zairean rhumba, and South African mbaqanga and mbube. Black Umfolosi exemplifies the mbubu tradition of Nguni vocals and harmony sung a capella. Older people have a greater affinity with traditional music, but all Zimbabwean music is influenced by the rhythms and melodies of the mbira . Western music is popular, and artists are influenced by it to varying degrees. Several Zimbabwean films have been commercially successful, including Flame, Jit, Everyone's Child, and Neria . Flame has a political focus, and the other three have social themes. Before independence, black Zimbabwean college enrollment was low, particularly in technical colleges: the tendency was to find course places in universities and technical colleges outside the country, and in academic courses rather than in technical or vocational courses. The expansion of primary, secondary, and tertiary education with independence meant an expansion of the social sciences, in particular education. This was not matched by the same expansion in the scientific and technical fields of the physical sciences, engineering, and medicine. Therefore technical expertise and highly skilled labor has continued to be a constraint, and one which has at least in part been responsible for the white minority retaining a disproportionate share of economic resources. There are two state-funded universities, the University of Zimbabwe in Harare and the National University of Science and Technology in Bulawayo. The University of Zimbabwe is the older university and it has an international track record in the physical and social sciences, particularly in the natural sciences and in the application of social science to agricultural and rural development, and ecology, and conservation projects. The National University of Science and Technology opened in 1991 and offers courses in applied science, commerce, and industrial technology. Two private universities have also recently been established: Africa University, funded by the United Methodist church in Mutare, and Catholic University in Harare. The Harare Polytechnic and technical colleges in major towns offer vocational and technical training courses. Support from international donors has been provided to the applied social sciences, media and communication studies, the applied natural sciences, and biotechnology at the University of Zimbabwe. Beach, David. "Cognitive Archaeology and Imaginary History at Great Zimbabwe." Current Anthropology 39 (1): 47–72, 1998. ——. The Shona and the Neighbours, 1994. Berliner, P. F. The Soul of the Mbira: Music and Traditions of the Shona People of Zimbabwe, 1978. Bourdillon, M. F. C. "Religious Symbols and Political Change." Zambezia 12, 1984–1985. ——. Where Are the Ancestors: Changing Culture in Zimbabwe , 1997. ——. Religion and Society: A Text for Africa, 1990. Bourdillon, Michael. The Shona People, 1976. Burgess, S. F. Smallholders and Political Voice in Zimbabwe, 1997. Burke, T. Lifebuoy Men, Lux Women: Commodification, Consumption, and Cleanliness in Modern Zimbabwe , 1996. Chavunduka, G. L. Traditional Medicine in Modern Zimbabwe, 1994. 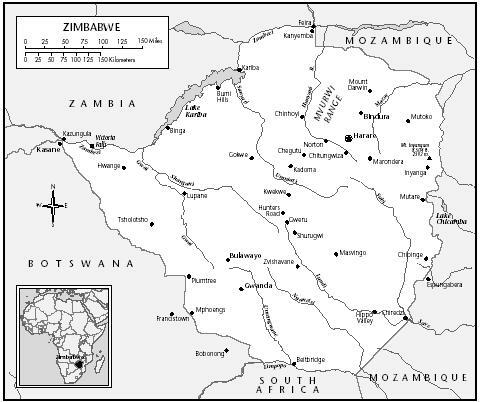 Cheater, A. P. "The Ideology of 'Communal' Land Tenure in Zimbabwe: Mythogenesis Enacted?" Africa 60 (2): 188–206, 1990. ——. Idioms of Accumulation: Rural Development and Class Formation among Freeholders in Zimbabwe , 1984. ——. "Formal and Informal Rights to Land in Zimbabwe's Black Freehold Areas: A Case Study from Msengezi." Africa 52 (3): 77–91, 1982. Chinodya, Shimmer. Can We Talk and Other Stories , 1998. ——. Harvest of Thorns , 1989. Cox, J. "Ancestors, the Sacred and God: Reflections on the meaning of the Sacred in Zimbabwean Death Rituals." Religion 25 (4): 339–55, 1995. ——. "Significant Change and Religious Certainties." The Zimbabwean Review 2 (1): 8–9, 1996. Dingirai, V. and M. F. C. Bourdillon. "Religious Ritual and Political Control in Binga District, Zimbabwe." African Anthropology 4 (2): 4–26, 1997. Fontein, Joost. "Great Zimbabwe: A Sacred Site or a National Shrine?" M.A. dissertation, University of Edinburgh, Edinburgh, 1997. Gaidzanwa, R. "Women's Land Rights in Zimbabwe." Issue , XXII (2): 12–16, 1994. Garbett, G. K. "Disparate Regional Cults and a Unitary Field in Zimbabwe." In R. B. Werbner, ed., Regional Cults , 1977. Gelfand, Michael. Diet and Tradition in an African Culture , 1971. Gordon, R. "Girls Cannot Think as Boys Do: Socialising Children through the Zimbabwean School System." Gender and Development 6 (2): 53–58, 1998. Hancock, Ian. White Liberals and Radical in Rhodesia 1953–1980 , 1984. Hapanyengwi, Chemhuru O, and Ed Shizha. "Through Zimbabwean Eyes." Journal of African Religion and Philosophy 4 (2): 45–47, 1998. Harbitz N J. "Mediums in Zimbabwe's Media." In Media Culture and Society 18 (4): 669–676, 1996. Hasler, R. Agriculture, Foraging, and Wildlife Resource Use in Africa: Cultural and Political Dynamics in the Zambezi Valley , 1995. Hobsbawm, E., and T. Ranger, eds. The Invention of Tradition, 1983. Horn, N. E. Cultivating Customers: Market Women in Harare, Zimbabwe, 1994. Jones, Claire. Making Music: Musical Instruments in Zimbabwe Past and Present, 1992. Kaarsholm, P. "Inventions, Imaginings, Codifications: Authorising Versions of Ndebele Cultural Tradition." Journal of Southern African Studies 23 (2): 243–258, 1997. Kriger, Norma. Zimbabwe's Guerilla War: Peasant Voices, 1992. Lan, David M. Guns and Rain: Guerillas and Spirit Mediums in Zimbabwe, 1985. Lessing, Doris. African Laughter , 1992. ——. Under my Skin: Volume One of My Autobiography, to 1949 , 1994. Lonely Planet. Zimbabwe, Botswana and Namibia , 3rd ed., 1999. Martin, David, and Phyllis Johnson. The Struggle of Zimbabwe: The Chimurenga War , 1981. Matshalaga, N., ed. The Political Economy of Poverty in Zimbabwe , 1996. Meekers, D. "The Noble Custom of Roora: The Marriage Practices of the Shona of Zimbabwe." Ethnology 32. 35–54, 1993. Moyo, S., P. Robinson, Y. Katere., S, Stevenson, and D.Gumbo. Zimbabwe's Environmental Dilemma: Balancing Resource Inequities , 1993. Mungoshi, Charles. Walking Still , 1997. Murphree, M. W. "Strategic Considerations for Enhancing Scholarship at the University of Zimbabwe." Zambezia , 24 (1): 1–12, 1997. Mutswairo, Solomon, Emmanual Chiwome, Nhira Edgar Mberi, Albert Masasire, and Munashe Furusa. Introduction to Shona Culture , 1996. Ndoro, W. "Great Zimbabwe." Scientific American 277 (5): 62–67, 1997. O'Keefe, P., and S. Moyo. "Land Tenure in Zimbabwe." Review of African Political Economy 70 (23): 579–580, 1996. Phimister, J. Wangi Kolia: Coal, Capital and Labour in Colonial Zimbabwe, 1884–1954 , 1994. Ranger, T. "Making Zimbabwean Landscapes: Painters, Projectors and Priests." Paideuma 43: 59–74, 1997. ——. "Missionaries, Migrants and the Manyika: The Invention of Ethnicity in Zimbabwe." In Leroy Vail ed. The Creation of Tribalism in Southern Africa , 1989. ——. Peasant Consciousness and Guerilla War in Zimbabwe , 1985. ——. The African Voice in Southern Rhodesia, 1898– 1930 , 1970. Republic of Zimbabwe. Census 1992: Zimbabwe National Report , 1994. Reynolds, P. Dance Civet Cat: Child Labour in the Zambezi Valley , 1991. ——. Traditional Healers and Childhood in Zimbabwe , 1996. Riphenburg, C. J. "Changing Gender Relations and Structural Adjustment in Zimbabwe." Africa 52 (2): 237–260, 1997. Roe, E. M. "More Than the Politics of Decentralization: Local Government Reform, District Development and Public Administration in Zimbabwe." World Development 23 (5): 833–844, 1995. Scarnecchia, T. "Poor Women and Nationalist Politics: Alliances and Fissures in the Formation of a Nationalist Political Movement in Salisbury, Rhodesia, 1950–56." Journal of African History 37 (2): 283–310, 1996. Schmidt, Elizabeth. 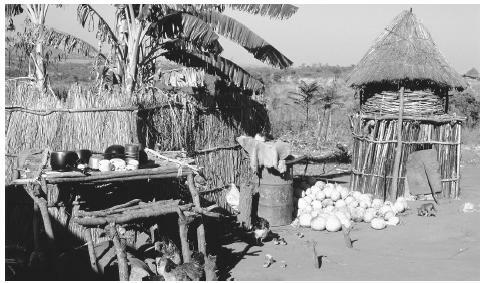 Peasants, Traders and Wives: Shona Women in the History of Zimbabwe 1870–1939 , 1992. Scoones, I., et al. Hazards and Opportunities: Farming Livelihoods in Dryland Africa: Lessons from Zimbabwe , 1995. Stoneman, C. ed. Zimbabwe's Prospects , 1988. Stoneman, Colin, and Lionel Cliffe. Zimbabwe: Politics, Economics and Society , 1989. Style, Colin, and O-Ian. Mambo Book of Zimbabwean Verse in English , 1986. UNESCO. General History of Africa , 1993. Walker, P. J. "The Architectural Development of Great Zimbabwe." Azania 28 87–102, 1993. Weinrich, A. K. H. Tears of the Dead: The Social Biography of an African Family, 1991. ——. Chiefs and Councils in Rhodesia: Transition from Patriarchal to Bureaucratic Power, 1971. Werbner, R. Ritual Passage, Sacred Journey: The Process and Organization of Religious Movement , 1989. ——. African Farmers in Rhodesia: Old and New Peasant Communities in Karangaland , 1975. Werbner, R. P. "Atonement Ritual and Guardian-Spirit Possession among the Kalanga." Africa 34 (2): 113–136, 1964. Zimbabwe Women's Resource Centre and Network and SADCC–WIDSAA. Beyond Inequalities: Women in Zimbabwe , 1998. Hey This article is very well written i am happy to see that this type of writting exsists today!! I have recently gathered and produced a powerpoint on Great Zimbabwe and would be happy to share some insight!! This website has saved 2 of my geography projects so far. I don't know what I'd do without it; it's great! A well reseached presentation of facts. this is an execellent presentation. keep it up. Very ineresting and quite informing. I am in a dilema as i have migrated to England and my customary marriage has no paper evidence. It has become so difficult for me and my husband(the zim way) partner (the british way). the authorities have declined that there is such marriage in zim but my parents and my in-laws binded us legally and in zim i am a wife and he is a husband.My father had his lobola and the rest of the families acknowlegde and this is common in zim. more info is being requested.thanks. This has helped me so i am up tring to finish a public speaking paper and now i have everything i was looking for. Thanks for the comprehensive article! It covered everything that I needed for my paper, whew! You guys are awesome! You TOYALLY saved my s.s. project!! Thank you, the article helped me so much for my project. I expected a lot of inaccuracies, as is usually the case with outsiders looking inside but I must say you did my country and cultures a great service. Now for the BUT - your picture on village houses is VERY incorrect! What you call a house is just a chicken house! Also, many Shona and Ndebele words you used are misspelt. If you correct these two, you will have my full and unreserved praise. Ndatenda. Ngiyabonga. Thanks. Loved this article it has thought me more about Zimbabwans and thier culture. This article was well reseached, and very well written. thanks alot for the very insightful information. That was a fantastic and very helpfull read. It was so comprehensive and well structured and covered everythig i wanted to know about Zimbabwe. Great Article that tells you all you need to know about the culture of Zimbabweans. Am a Zimbabwean myself who feels very strongly about the religious state of Zimbabwe. As a christian I find that most Zimbabwean proffessing Christians mix christianty with traditional beliefs about spirits. I find Zimbabwean christianity false and misleading, in fact every Zimbabwean I know calls themself a Christian even if they are not one. Something is very seriously wrong because its either you are a Christian or you are not. This website was ahmazing! It helped me so much with my Zimbabwe culture project! however made it was genious!! Thanks to the creatures. I love this and if I have any country that I have to find the culture on, I'll come here! I'm doing a project on Zimbabwe and this helped me sooooo much! Thank you Ann Muir for writing this article! This article had all the info I needed! There was not one thing I couldn't find in here! This article rocks! This is awesome and wonderfull.this is the best site ever to find info. We want to reverte back to a full Zimbabwean culture as the norm of black Zimbabweans . Help me with much detailed cultural practises from a wide spectrum of tribes in Zimbabwe. I am done with my Intercultural paper. its really wonderfull article but i want to know more about the music there? ?what kind of music they litsen? ?what's the more puplic music?? this web site is the first website that actualy helped me with a school project. sweet! you guys rock! thanks you saved my life! i go a really good mark on my s.s. report! i am doing a cultural booth presenting on zimbabwe, may i use the pictures in this blog? One of my long long standing employees, previously living at my home, has passed away. He has been transported back to his home in Zim. and buried at his family home in Binga. Please advise the procedure regarding the managing of his possessions which will go to his family members in Gauteng for distribution. Am I entitled to have his living quarters cleaned and tidied whilst awaiting for his family to return from Zim. prior to their return which will take 3 - 4 weeks. According to local belief (heard from his work colleagues) I may not touch anything in his room at present & must wait for his family to return and undertake this task. Would appreciate your feedback on this traditonal/cultural belief. This article gives insight to how much Zimbabweans could be rightly perceived to be rootless Africans. They are so much out-of-touch with their indegeneity. Colonialism truly did its job to Zimbabweans. It still amazes me the ridiculous names Zimbabweans give their children in pursuit of whiteness. That is also symptomatic of the state of mental slavery that still persists there. Nonetheless, a good article. facts on zimbabwe,I couldnt find anything before the war but this is some useful info! As music and dance moves some musical pieces are not to be danced to anyway,but what dance do the people of Zimbabwe perform on the mbira music? Very good quality of writing! This was a good, informing section and I learned a lot about Zimbabwe. I think it would be neat to include a little more about traditions and celebrations, but other than that, I rate this article #1! this is culture on zimbabwe and i would like to do my report on them. i hope this is enough information to learn. there are alot of pictures that will help too. thank u guys for coming up with a usefol and very educative document .I am using it for my gender studies. Thank you for all the information it really help me for my research. This document is great for anyone trying to find out information about Zimbabwe or just interested in learning about it. wonderful and a greatly informative article!!! it makes me proud to be ZIMBABWEAN!!! Great article. Had all the info I needed. Will come back in near future to learn more. Much helpful. I got all I needed for my assignment. Thank you . As a South African I have been keen in understanding Zimbabwen culture,it is so amazing to discover how similar are our cultures are as African,especially the marriage and lobola thing. Thanks for such all the information. What is the source of the map in this article? We would like to get permission to reproduce in a publication. Thanks so much it helpful. I got all I needed for my assignment. Thank you . Is it customary for the men to take care of their mothers or daughters? Thank you guys for a well researched article which is helpful for us the scholars of today. I would like to know more about the special foods consumed by the different cultures in the country if you could assist me please. otherwise this was a job well done. Great work. quite an interesting and fruitful article as well as enlightening...quite frankly it has helped me a lot in my research and iam very much sure iam going to present a fully baked essay with facts and interesting observations...i have a question though...what values and beliefs does marriage payments constitute about both men and women's roles and statuses? Thank you so much. Before I found this site i couldn't find any of the information I needed. Really great article. i'm in seventh grade and we have a 440 point project on Africa. My country was Zimbabwe so this article was very useful. i just wish you could add stuff about the rituals, celebrations, and festivals. otherwise, great article! Quite informative indeed. Not is not anticipated as you look at the data from the prologue; but as you proceed with the pages downwards, then much of its sanity is brought into limelight and our senses are appeased and enticed by the fact of the expanse knowledge and history that our country carries. Blessed be we for the goodness of our most profound and rich heritage. Thankee. I was amazed at this website, I am in grade 6 and we have a essay to write on Zimbabwe and the website helped me a lot. THANK YOU! My partner is from Zim and this website was really helpful in my ongoing Zimbabwean education! A well presented piece of work. It is helping me on my research on traditional healers. Keep on keeping on!!! This is such a great article. I am in 7th grade and I got a project that me and my group had to know all about Zimbabwe and make a house, food, and wear clothing from there. This really helped me. Thanks! Wow! Great artical. It helped a lot in my geography class! I desperatly want to visit zimbabwe and this is a good background as to why! Thanks SO much! thank you so much! I am working on an ethnic project for social studies, and this will be so helpful!! Thanks. I also need to know what the good and bad economical, environmental and social factors are. Good website though because I found a little of what i needed to know. This really helped. Geography is hard, and so, I think we all know how that works. this really did help me with a project I'm doing. the things it said were great and it helped me learn more about the people and their culture. So much information.It has widened my knowledge about Zimbabwe. wonderfull, well researched. it has help me do my project about the culture of Zimbabwe. Really pleased with this article, I lived in Rhodesia/Zimbabwe from 1973 to 1985 and came across this website. Well researched, quite accurate and brought back so many memories for me. I can relate to the photographs, have various pictures of my own. What better than a walk down memory lane. THANK YOU. A special thanks to the author for such a beautifully written article. It has been really hekpful when i was writting my regional report. Quite an eye-opener and very informative article, thank you very much. It has made me note quite a number of points for discussions between my Zimbabwean man and I before we walk down the aisle. What happens to the property a woman (foreigner) already owns before marriage? Are prenuptial agreements recognized in Zimbabwe? It would be good to get some information on cross-cultural marriages. A well researched article... But its only talking of our roots and most people would love to know about the present morden day life in Zimbabwe. GOOD STUFF.I AM THRILLED TO LEARN AND KNOW ABOUT MY CULTURE AND ITS SURROUNDINGS. I pleased very after reading this article. I am from a country where not much of this information is always nothing available. I very happiness to enjoy this information and to feed and help the brain of others to learn more about their world. well researched informative i would say. who ever wrote this YOU HAD YOUR MIND AND HEART IN IT. in this evidence era we are living in, this objective article has provided me with a reference for my write up. well done. Well Researched.It even helped me with my presentation in a foreign country.We need more of these researches concerning our culture. Thank you for that wonderful artical that u have provided me for my project about Zimbabwe! Thank you for your splendid article, it helped me carry out my project. thank you for this information! you are the only source that i need for my pre-ap geography project. thank you!! This is so amazing it helped me so much! i really like Zimbabwe! Thanks you guys! I am planning a cultural event in my country Botswana and would like to invite an Association or Cultural group to come and showcase your culture in terms of dance, food and dressing. We have to do a project in my TDA and I am in 8th grade but it has to be a country nit in the us and I choose Zimbabwe you did great research thanks! It was well written but I would like a little bit more about the daily life because I feel like it could have used a bit more. I am a kid and I am doing a research project for my 8th grade English class and I thank you very much for your help. Point of correction on rural distribution of land. It is not the men who are given land in rural areas. A married man gets land but not a single man. A single woman can get land on her own because when it comes to inheritance it is her brothers who inherit land from the parents. That's because the home is owned by the woman and if he divorces her or she dies only her children can inherit the land. Even if she leaves and goes back home if the family decides to give the land to someone else it can only be done with her family agreeing. Culturally if she had sons the land would be left for her sons to claim when they are older. But neither of them can bring another spouse onto that land especially if they have kids, that is taboo and unacceptable because again for the man to do that will bring ngozi from the wife's family side and for the man it's to do with inheritance, his kids cannot inherit that land and another woman cannot use another woman's kitchen or sleep in her bedroom regardless of the reasons for her absence, Dead or alive it's still the other woman's property even if she was chased away or walked away. That's why you see in rural areas if there are major family events including funerals and weddings the wife's family are given use of their daughter's kitchen to cook their meals and her bedrooms to sleep in.The husband's will either cook out or eat with the rest of the gathered people. The wife owns the kitchen and all it's contents and the bedroom and sitting room and all it's contents. She also owns what are now called cash crops and dura ramai is taboo to get anything out of without her go ahead. To the point that even when she dies permission from her family is required to use her utensils and her food. Father owns the staples like maize and other low cash goods and of course the plough and tools. But with animals if she buys or is given her own animals they are hers for life unless she specifically gives them to someone and that has to be known and witnessed to avoid having to pay those back cos of ngozi issues. Most of this staff is now ignored because we live urban laws and rural laws and not to forget the church culture which are so confusing most of the times most people don't know which is which.